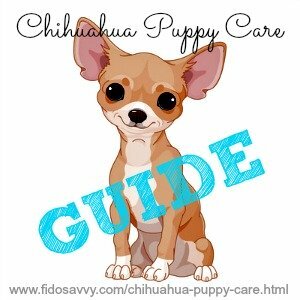 Everything you need to know about Chihuahua puppy care, all in one place! Although taking care of any puppy has some standard guidelines, raising a little chihuahua puppy is quite different from raising a large breed pup like a Great Dane or even a Labrador Retriever. 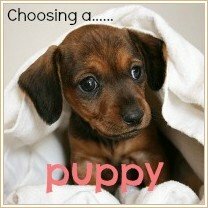 Tiny breeds have very unique, individual needs and if you want your chihuahua puppy to be healthy, happy and safe in his new home, it's important to know what these are. 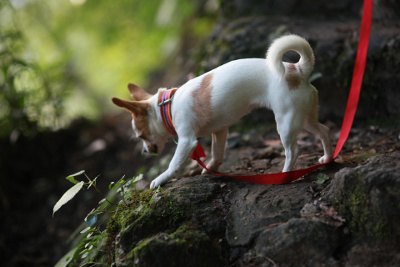 Use these quick links to jump to the section or topic you're interested in right now, or scroll through the page to find out everything you'll need to know to keep your Chi happy and healthy. As I mentioned earlier, tiny dog breeds have their own set of health concerns. 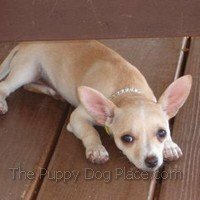 So, if you are planning on having (or already have) a chihuahua puppy in your home, you need to be aware of these so that you can take the very best care of him/her. Some of these include a collapsed trachea, luxating patellas, hypoglycemia (low blood sugar), heart problems such as Pulmonic Stenosis, and hydrocephalus. Many of the things you need to do to keep your puppy healthy are the same, whichever breed or size of pup you own. My Puppy Health page has lots of info. to help you with this. Of course, all breeds have their own set of congenital weaknesses, but the chihuahua and other tiny breeds are also at greater risk of accidental injury that their larger 'cousins'. Constipation is something that small or tiny dogs seem to suffer from more than the larger ones. My Constipated Puppy page can fill you in on what you need to know to prevent, or treat, this problem. An important part of chihuahua puppy care is protecting your precious puppy from being sat on, stood on, dropped, tripped over, shut in a door, or any one of a dozen other scenarios! You may also be surprised at how easy it is to 'mislay or lose' a 1lb pup, and if that tiny baby happens to get outside without you knowing about it, or slips through that tiny gap in your fence, a tragedy could quite easily unfold. For these reasons, if you already have a medium or large breed pup or dog, or small children, a chihuahua may not be the best choice for you. Many people think that a tiny dog is ideal for a young family, but that's generally not true. Although your 3 year old (or 5/6/7 year old!) may try very hard to be careful with the new puppy, an over-excited squeeze could really hurt his new pet. Even worse, a startled or nervous reaction could make him drop the puppy, or the normal running/jumping and rough-housing of kids at play could end in disaster. If you have young children, check out my Best Dog Breeds for Children page for more tips and advice on finding the perfect puppy for your kid-oriented home. The basic requirements for taking care of a puppy are pretty much the same, whether you're the proud owner of a Great Dane or a Yorkshire Terrier. I'd suggest taking a look at the following pages because they have all everything you need to know, then come back here for some more chihuahua puppy care tips. Although small breed dogs tend to reach maturity faster than the large/giant breeds, tiny breed puppies can be slow to grow and develop at first. There's no way to tell for sure exactly how big your puppy will grow up to be, but there ARE ways of estimating his adult weight. Check out my Puppy Weight Estimates page for more information. For medium to large breed pups, it is generally best to wait until a puppy is at least 8 weeks old before letting him go to his new home, but with very small breeds, 10 or 12 weeks is recommended. 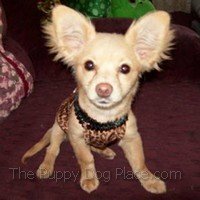 How about considering Chihuahua rescue? there are lots of Chihuahuas sitting in pounds and rescues all over the country, just waiting for their new forever families. ...and of course, there's always the national organization, Petfinder.com. You can use the handy tool below to search listings of dogs and puppies available for adoption in your area (and nationwide). Information on feeding your little one is an important part of any chihuahua puppy care guide. Tiny chihuahua puppies have tiny little tummies - but a very fast metabolism! This basically means that their little bodies 'use up' their food very quickly. To help make sure that their blood sugar levels remain constant and prevent hypoglycemia, it's important to make sure that your puppy eats 'little and often'. A chihuahua pup should be fed at least 4 times a day, for the first 6 months or so. After that, 3 times a day should be okay until your puppy is mature (at around 1 year of age), when you can go down to 2 feedings per day. Although medium and large breed adults are usually perfectly happy with one meal a day, little dogs like chihuahuas will always need to be fed at least twice daily. Knowing which are the best puppy food choices, and choosing kibble which is specifically designed for small and tiny breed pups is also very important. Tiny breed pups sometimes do better on canned puppy food, at least to start with, because it's easier to chew. As they grow, they may get better nutrition from dry kibble and so you can switch over, or at the least mix the two different types together. Water should be freely available, but make sure the bowl is tip-proof and not big/deep enough for your puppy to fall into! Tiny puppies may try to climb into a bowl that seems too big, and it is perfectly possible for them to drown in this way. It's also important to be prepared for hypoglycemia, just to be on the safe side. Before you bring your puppy home, familiarize yourself with the symptoms of low blood sugar (can include weakness, confusion, low body temperature, poor co-ordination, drowsiness or even loss of consciousness), so that you know when to take action. Hypoglycemia can be a very serious condition, so have a tube of Nutri Cal on hand before you bring your puppy home. This is a vitamin and calorie rich paste, which is used as a dietary supplement, or to give hunting/working dogs an extra 'boost' of energy. If your chihuahua is having problems with his blood sugar, a little of this paste could save his life. Make sure you are aware of what foods are poisonous to dogs, as a minute amount of a toxic/dangerous food can cause serious problems in tiny puppies. There are two main' themes' when it comes to puppy training - housebreaking and obedience training... both are important if you're taking proper care of your pup. 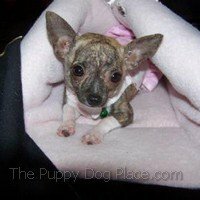 Potty training Chihuahuas (and many other small/toy breeds) can be a challenge, and I would strongly recommend that new puppy owners buy a crate and use it to housebreak their puppy. You can find all the tips and advice you need for this on my Crate Training page. It really is the simplest and quickest method. Be prepared to be patient though! Tiny pups have tiny bladders, which means FREQUENT trips to eliminate, and the fact that these puppies mature slowly at first doesn't help matters. But chihuahuas are smart little dogs, and if you are consistent and patient in your training, your puppy will eventually understand what you expect from him. 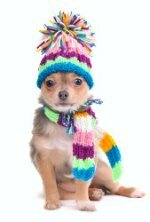 Although I always suggest that you potty train a puppy to do his business outdoors, tiny breeds like the chihuahua can find it difficult, and uncomfortable, to be outside in cold or wet weather. If you live in an apartment without a fenced yard, or in a high-rise building, it is also sometimes necessary to use an indoor dog potty. 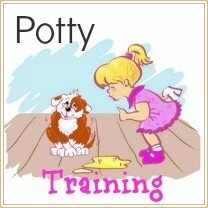 See some of the best on the market on my Indoor Dog Potty page. Puppy pee pads are can also be an option, although they're best used for emergencies or over the short term only. Try OUT! Dog Training Pads with Moisture Lock for example. 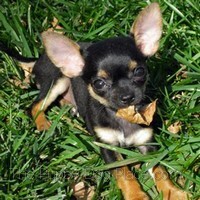 Obedience training is a must for Chihuahua puppies and ALL other puppies for that matter! Ensure that your chihuahua puppy care routine includes regular training in basic manners and acceptable puppy behavior, and although you should NEVER shout or smack your puppy, gentle and loving discipline is the key. Socialization should be built into your Chihuahua's daily routine. Socializing your puppy means helping him feel confident around different people and animals, and in a variety of situations and environments. 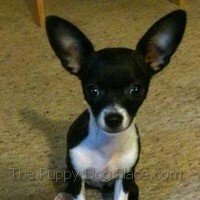 This page.. How To Socialize Your Puppy... has tons of tips and ideas to help you do this properly, and make sure that you both enjoy the process. That cute little 'baby' Chihuahua can very easily become a spoiled brat if left to his own devices. Little Dogs: Training Your Pint-Sized Companion is the perfect book to give you a little bit of help with that training. 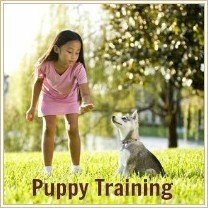 It has a wealth of information, tips and training techniques which have been specifically designed with your tiny, 'pint-sized' pooch in mind. All the 'small dog issues' are addressed with love and ingenuity here, and you'll find this book will help you understand, communicate with, care for, and train, your tiny puppy more easily and effectively. As your Chihuahua puppy is definitely of the 'pint-sized' variety you don't want to miss this one - I'd say it's a must have! Chihuahuas are little dogs, but they can be big on attitude! Obviously, every pup has his/her own personality and you may have a laid-back little guy, or a super-charged little girl... or something in between. However, don't make the mistake of thinking that your puppys' size makes him helpless, defenseless or meek. 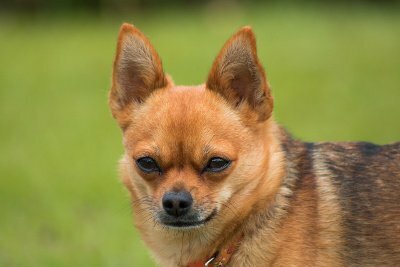 Chihuahuas have a lot of the terrier nature, and can be stubborn, fiery and manipulative - yes, those tiny brains are pretty quick! This is one toy breed that can actually think and act like a guard dog! They can be protective and territorial, and often make enough noise to at least sound fierce. The AKC standard describes the chihuahua temperament as 'an attitude of self importance, confidence, self-reliance', and that sums it up pretty nicely I think. A well-bred chihuahua should exhibit an alert yet calm confidence, and he may take a little while to 'warm up' to other dogs and people he isn't familiar with. 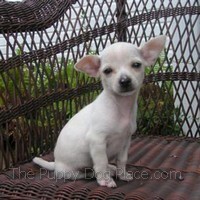 BUT, a Chihuahua puppy should never be overly suspicious or 'neurotic' in his behavior. Excessive barking, nipping, growling or biting are definitely not allowed, and you shouldn't see this in a puppy at all. Due to the popularity of these little dogs, many people breed them irresponsibly and end up with unstable, yappy, fearful or aggressive dogs. This poor breeding also results in a higher incidence of health problems, so be very careful and do your research before buying your puppy. In addition to the feeding, healthcare and housebreaking, there are just a couple more things you'll need to do to keep your little guy in tip-top shape. Chihuahua puppies are usually very, very small and have thin coats, this makes them very susceptible to extremes of temperature, especially the cold. Another important part of chihuahua puppy care is keeping your little guy or gal warm when outdoors. You can have fun with this by choosing a couple of adorable 'outfits' for your pup to wear when outside. There are even boots to keep his paws warm! Most chihuahuas hate cold, wet weather (and who can blame them when they're that close to the ground! ), and this can complicate housebreaking in the winter time. But a nice warm sweater or jacket, can help to make your little guy more comfortable when he has to take a 'potty break. Grooming Chihuahuas is basically the same as grooming most other breeds. Long coated chi's obviously need more grooming than the short-haired variety, but be sure to choose a soft brush and be gentle. Don't be tempted to over-bathe your little one. These puppies are not like babies, they don't need a bath every other day, or even every week. A bath once every 8 weeks or so should be more than enough, unless of course your little 'chi' falls in a mud puddle, or rolls in something 'icky'! Puppies have very sensitive skins, and too much bathing can result in itching and irritation, over-dry skin/coat, or even thinning hair. Never use a medicated (flea/tick etc) shampoo on a young puppy, it is dangerous. Check out my Bathing A Puppy page for advice on how to give make your puppy's bathtime fun and effective. The Chihuahua is a very old breed and, although the details of its' history are vague, it is known to have originated in Mexico, with some of the 'chis' more ancient ancestors being thought to have existed alongside the Aztecs. Some of the first dogs were seen in the USA in the mid 19th Century, and the Chihuahua was recognized by the AKC in 1904. Due to this tiny breeds' huge popularity, there are many, many chihuahuas around today, resulting in a huge variation in size, color, coat and temperament. See more adorable Chihuahua puppy photos here! However, in terms of the AKC breed standard, there are only two classifications - long coated or short coated. And despite the fact that you might see chihuahua puppies advertised in 'Standard, Miniature, Teacup, Pocket-size' varieties, there are no individual classifications for size. The AKC standard reads simply 'A well balanced little dog not to exceed 6 pounds'. Of course, many chihuahuas are larger, or smaller, than 6lbs, but being especially tiny (such as the puppies advertised as 'teacup' pups) is not something rare or desirable, and shouldn't be more expensive to buy than your 'average' chihuahua. In fact a mature dog that weighs less than 3lbs could be more at risk for health problems, and chihuahua puppy care for the very tiniest specimens of this breed can be very tricky and requires a lot of patience and supervision. The larger dogs (sometimes weighing up to 10lbs or even more), are not 'inferior', and may even be healthier and more robust, which could well save you some money at the veterinarians' office! Of course, please remember that this chihuahua information is mostly generalization, and every puppy/dog is an individual. Buying from a reputable breeder will increase your chances of getting a happy, healthy pup, regardless of his size. The well bred, and well taken care of, Chihuahua can be expected to live for 15 - 17 years or more (some chihuahuas have lived to be 20! ), in fact this breed is known for its' longevity. So, if you are considering adding a chihuahua puppy to your life, be certain that you are prepared for it to be a long-term commitment.